This is a letter to Miss Martha Berry from Michelsen's Tropical Fruits who are informing her that they cannot make a donation of citrus fruit as she requested. 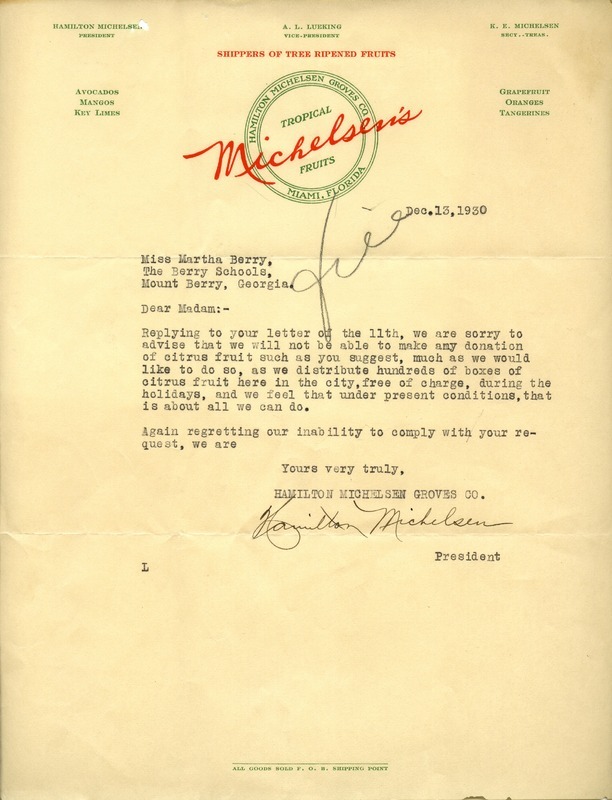 Hamilton Michelsen, “Letter from Hamilton Michelsen to Martha Berry.” Martha Berry Digital Archive. Eds. Schlitz, Stephanie A., Sherre Harrington, Angela McCavera, Meredith Coleman, et al. Mount Berry: Berry College, 2013. accessed April 19, 2019, https://mbda.berry.edu/items/show/13408.